So glad you enjoyed. Very creative to use pesto on one version. I don’t know why people are so hung up on the author providing nutritional information when most of the people who try these recipes change the way it’s done or the ingredients that are in it. Y’all know most of these ingredients are going to be little to no carbs, and besides that, you should be keeping track of your own carbs, macros, and nutritional information as it is different for every person. With that said, the people who write and post these recipes go through a lot of trouble to do this for us, and to give us free recipes! I mean, they could be putting it in a book and charging us for it! I for one am grateful and will take the time to input the ingredients into my own nutritional app! Thank you Kalyn! Love it!!! Thanks so much Mark! I appreciate the support! I love the idea of using chicken as the base! I have a similar pizza recipe that is to die for. Hello! 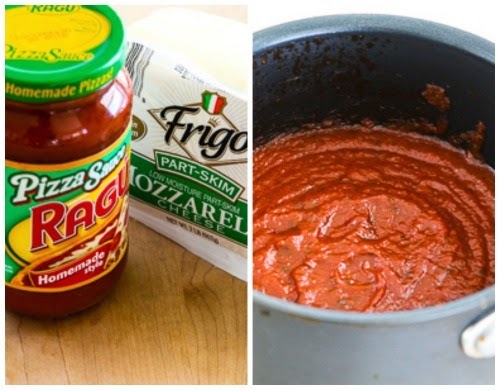 I’m going to make this tonight…curious if I could use a small jar of :”pizza Quick” sauce instead of reducing the pizza sauce? It’s Ragu as well. Looks delicious…my kids gave me the thumbs up! I can’t really answer because I’ve never used that type of sauce. The reducing is to remove the excess liquid in the sauce. Without doing it the finished dish will likely be watery in the bottom. First a confession. It drives me crazy when I see recipe reviews where the person changed every ingredient (“I didn’t have any eggs so I used peanuts”) and wonders why it didn’t work. 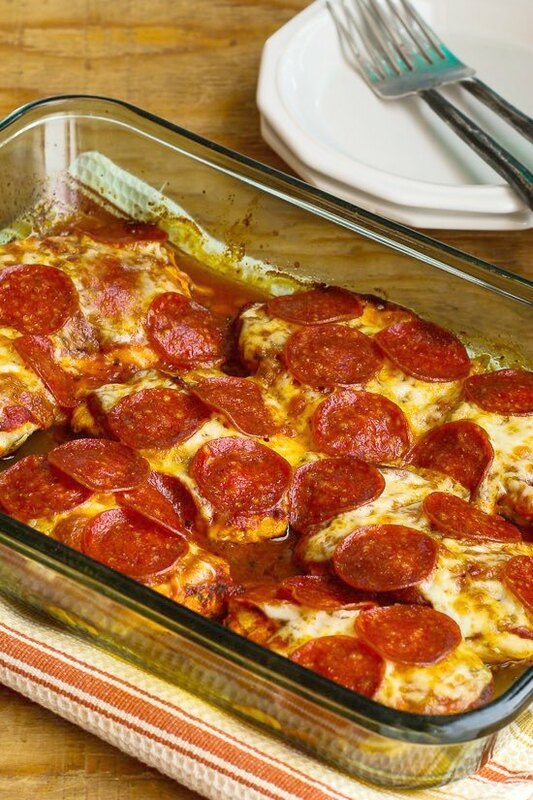 But … my husband is doing low carb right now and I needed pizza so… anyway, I added our other favorite toppings to this recipe and it was great!! On half of the chicken breasts I added sautéed mushrooms, sliced jalapeños, and diced green bell peppers (under the cheese). I added bacon crumbles on top of all of them. It was amazing. Served it with a big salad and we have enough for another meal (just the two of us). Great recipe!! So glad you enjoyed it! I know what you mean about switching ingredients. But I don’t mind at all when people adjust the recipe to their own preferences and it comes out great! Made this tonight and calculated the macros myself by my ingredients….which I do with every recipe I try 🙂 easy peasy! Thanks so much for sharing! Delicious!!! So glad you enjoyed it, and thanks for taking responsibility to do that yourself! I will definitely be making this recipe again! Everyone loved it! Even those who are not doing low carb. Before everyone was done eating they were already telling me to make sure that I make this again! I pretty much stuck to the recipe, the only thing Is that I used shredded mozzarella instead of slices because that’s what I had on hand and it came out beautifully. So happy to hear it was a hit with everyone! Tried this last night and didn’t disappoint, super yummy! Sorry but I wouldn’t want to guess. You could check the info in Yummly, knowing that they may not be calculating at the lowest possible carbs for pizza sauce. Thanks for sharing! Does it keep very well til the next day? It’s best freshly made but not bad refrigerated for a day and reheated in the microwave the next day. Hope you and the son will both enjoy Heather! I know you’ve said you won’t post nutritional information because it takes “a lot of time”. But, if you’re offering recipes that are geared toward people on a keto diet, surely you know the importance of us having that information. I’d love to try this recipe, but I’ll move along without doing so, because you won’t take the time to give me the information I need. Not to be disrespectful but IMO, its irresponsible to publish a “diet” recipe without backing up that claim with the nutrition facts. I am sorry you feel that way, I guess you will just have to find recipes somewhere else. Here is a little more background for you. In September 2017 I switched my site to WordPress from a less technologically-complex blogging platform. (Yes, I should have done it years earlier, but that ship has sailed.) I knew there would be some things that wouldn’t transfer over, but I didn’t know that EVERY SINGLE POST would required editing. And I was switching so I could use the WordPress Recipe Plug-In to format my recipes, which also requires inputting information by hand on every post. I have been working since then (with three paid assistants) to edit recipes and put them into the recipe plug-in and we have about 30% of the recipes done. So there is absolutely no way I can calculate and add nutritional information to over 2,000 recipes on top of this. And I get comments every day from people who love my site and enjoy the recipes. So not to be disrespectful back to you, but obviously some people don’t mind calculating it or don’t need that information. I know that many of my readers use Yummly to see the nutritional information, which isn’t always accurate because it doesn’t recognize some ingredients, but much of the time the Yummly information is pretty close. I just checked and this recipe does have nutritional info in Yummly. And that’s a moot point anyway, because I simply CAN NOT do it at this time. Sorry you are unable to understand that. Wow Deb. Why do you think it’s her responsibility to make sure you are staying within your carb count? The woman has taken the time to share her recipe. If you can’t take responsibility for your own diet, then stroll on by. Kaelyn, you didn’t owe her an explanation. Now, on a better note, I’ve made this at least 3 times for my family and we love it. Thanks for sharing!! Thanks for the vote of confidence Daphne, so glad you have enjoyed the recipe! Can you use shredded cheese instead? Probably, but it will fall off and stick to the bottom of the dish a lot more than slices of cheese. Do you think I could use marinara sauce and still reduce it down? I think so, but it might not taste quite as much like pizza. I might add oregano. Also if you care about carbs, look for the lowest carb sauce you can find. Helping my sister ease into the habit of cooking for diabetic needs, and we started with this one. It turned out great! -we didn’t read far enough down the page while prepping so we assumed the cheese would need to be shredded, rather than just sliced, but this didn’t seem to change much. -we found it a little heavy on the oregano for our taste, and will likely just season one side next time we make it. Glad you liked it and that you’re already figuring how to make it work better for your own taste! I have over 2000 recipes on the site and spend 6-8 hours most days working on the blog. I just can’t edit over 2,000 recipes to add that info, and I know once I do it on one recipe people will expect to see it on every recipe. Thanks for understanding. Do you think this would work preparing ahead to the point of going in the oven? I want to try this but I always meal prep on the weekend for the week ahead. First, I haven’t tried it so obviously I can’t say for sure. But I think it might work to be in the fridge for a day or two. You’d have to let it come to room temperature when you cook it though, so that might defeat the purpose of preparing ahead. Love to hear how it works if you try it. Sauted mushrooms, pepper and onion strips added to it plus turkey pepperoni. Oh, I forgot I sprinkled black olives too. In the oven now, can’t wait for dinner. So glad to hear that. Sorry for the slow reply. For some reason I’m not getting notified of comments the last two days. Oooh, thanks for the ideas! I’m always looking for ways to sneak vegetables into my husband. He’s worse than the kids ever were! This was a huge hit in our house! Even with my three teenage boys who aren’t doing low carb with us loved it. I made them garlic bread to go with it but would even make them pasta next time as a filler. That way they wouldn’t eat so much of the dish. 😂😂 I even doubled the recipe. Love the idea of black olives. I bet mushrooms would be amazing too. So glad you enjoyed it and especially glad to hear it was a hit with the teens!